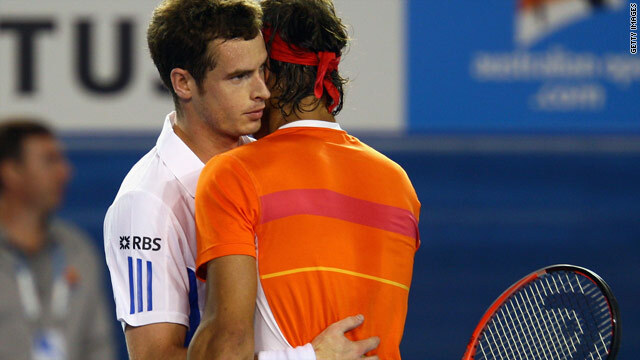 Andy Murray (left) consoles Rafael Nadal (right) after defeating the world number two at the Australian Open. (CNN) -- Reigning Australian Open champion Rafael Nadal was forced to retire hurt from his quarterfinal match against Andy Murray in Melbourne on Tuesday. The Spaniard, who suffered injury trouble for much of last season, was 6-3 7-6 (7-2) 3-0 down to the 22-year-old Scot when he pulled out of the match after struggling with his right knee for much of the third set. Murray spoke of his disappointment regarding the manner of his progression but was pleased with his standard of play. "I've known Rafa since I was 13, he's my favorite player to watch so I was gutted for him," Murray told reporters after the game. "I came through a few tough moments at the start of the match but I thought I found the right tactics to win, I played really well tonight. "I had to go for my shots and when the big points come keep them short, as you don't want to play long points against Rafa." Murray's victory sets-up a semifinal clash with Croatian Marin Cilic, who underlined his growing reputation by hitting 20 aces and 63 winners to consign seventh seed Andy Roddick to defeat. A win that has Murray keenly anticipating his next challenge: "Nerves will be there about making my first Australian final but I lost to [Cilic] in straight sets at the U.S. Open so there is a bit of revenge to be had there." Cilic, 21, toppled Roddick 7-6 (7-4), 6-3, 3-6, 2-6, 6-3, after the American battled with a shoulder injury for a large part of the grueling five-set, four-hour marathon match. Roddick hit back with 15 aces and 47 winners but Cilic, who took the scalp of U.S. Open champion Juan Martin Del Potro in the previous round, sealed his 10th win from 10 matches of 2010 to reach his first grand slam semifinal. World number one Roger Federer faces Russian Nikolay Davydenko in tomorrow's other quarterfinal while Novak Djokovic of Serbia will take on Jo-Wilfried Tsonga of France.